The worldwide leader in software, services and solutions, Microsoft has introduced its new SideWinder X8 Mouse, which the company claims as the first wireless SideWinder gaming mouse featuring Microsoft’s new BlueTrack Technology for the best speeds and feeds available, aiming to enhance your gaming experience. BlueTrack Technology – The world’s most advanced tracking offers next-generation tracking technology for gaming with image processing of 13,000 frames per second, 75g maximum acceleration and 120 inches per second maximum speed. 2.4GHz wireless connection – The SideWinder X8 is built for lag-free play with virtually no latency. Play and charge – Get up to 30 hours of active gaming on a single charge, or use the play-and-charge cable for nonstop action. The winding cord management system offers easy charging — simply unwrap the cord from around the storage box and snap it onto the underside of the mouse. Scroll wheel with tilt – The X8 mouse has better feel and response with detents for precise control. Engineered for speed – The shape was designed for quick, balanced and precise gaming actions. Vertical side buttons – The top and bottom design makes locating side buttons easier and reduces unintentional activation. The X8 also offers smart features to enhance the gaming experience, including an LCD screen on the mouse to quickly view dpi settings and macro-recording icons and Quick Launch button that provides one-touch access to Microsoft’s PC gaming features. DPI switching – Instantly switch sensitivity among high, medium and low with one click, ranging from 250 to 4,000 dpi (dots per inch). Replaceable mouse feet – Choose from three materials for glide preference. Seven programmable buttons – Customize five programmable main buttons, plus left and right tilt. Macro record button – Easily record macros while in game with the dedicated button. 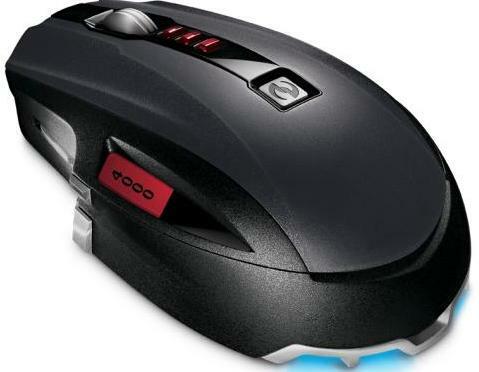 The new Microsoft SideWinder X8 Mouse which backed by a worldwide 3-year limited hardware warranty will be available by February 2009 for about $100, and consumers can pre-order it now on Amazon.com.